Mikes cleaning out the vest thread got me thinking about doing that to mine.......specifically my dry fly box, which is overflowing. There are patterns in there that I’ve carried around for the last two decades.......and which have never been tied to a tippet, but I’m afraid that if I remove them I’ll run into that once a decade, or lifetime, hatch, and I won’t have the perfect fly. A really good example of that happened a couple of years ago. I was upcountry on a popular freestone river below a dam, and below a large lake. Remember......I was on a very difficult to wade freestone river, and looking up into the air there were Large Mayflies everywhere. I thought........Hex’s? Can’t be. It was during the day......and Hex’s emerge in the evening/night.....and from ponds, not rivers.....well, not our rivers. This isn’t Michigan. Sure enough......they definitely were Hex’s. They had to have hatched the night before from the silt laden area above the dam in the lake.They were being blown out of the trees along the river. They were definitely Duns.......not Hex Spinners. Now.......did I have my pond box of flies with me? Of course not. any overflow Hex dries and Emergers were in the overstock box, a long ways back in the vehicle. I had nothing even close to match those flies with. A few choice expletives deleted might have been uttered. Obviously, since that day I always carry threeHex dries in my dry box.......even though that hatch happened *once* in the forty years I’ve been fishing that particular freestone stream. I don’t dare chance removing them from my dry box.......even though I’ll probably never have that happen again in my lifetime. Enough procrastinating, I need to go down to work on that box.......and tie up another dozen bh Trico Sunken Spinners for our time on the Bighorn this coming summer.......then on to the #24 Sulphur Spinners for the Spring Creeks. Thank goodness for 3.5X cheatertying glasses. Yes the SPINNER hatch is often very difficult to discern especially if it happens a bit upstream. Fishing rising everywhere and you just cant see anything on the surface or in the air. When that happens always put on a spinner pattern. I arrived at a well loved river with Quimby Pond, on a Father’s Day before we were both fathers. Also, at a freestone below a lake... we were met with the remnants of a dam so covered with 3.5” green dragon flies that a size 12 wading boot squished atleast a dozen bugs, and these were massive bugs. Nymphs were crawling, hatching and wings were drying. Every one that we flicked into the water was met with a gulp fitting a LMB within the first 3 feet of the drift. The entire dam was literally crawling like an amoeba. So, we all pulled out our 3” foam dragon flies and went to work.... wouldn’t that have been nice, right? Of course 3 dilelgent flies fishers were in trouble with 8 boxes each of nothing close. Despite the feeding frenzie, I caught 1 trout on a random olive green stimulator, and then lost it when the 2nd hook up wrapped me around the remnants of the dam. I now never fish that river without 3 x 4” green foam dragon flies. Hey- I know that bug. 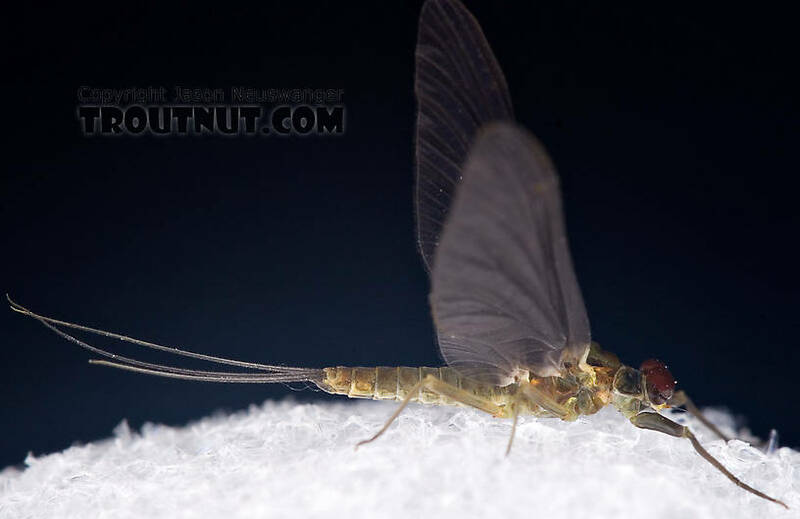 It drove me nuts one year trying to match the hatch and pattern the emergence. There’s another hatch that comes off on partly cloudy days in a VERY hit or miss fashion that brings LLS out to play in September. I gave up trying to ID the bug and just carry a few sulphur dries around now, along with still carrying a few hare’s ears to mimic the emerger. I don’t fish them the rest of the year. I love the cornuta hatch.... Shawmut, other places on that river upstream... other unnamed rivers in Central Maine..... Makes fish stupid.... Quigley cripple in a pale yellow- 14 or 16- right Hunter? Cornutas are a big western hatch as the tricos fade into fall, aren’t they? I believe ( I certainly could be mistaken here) that out West they’re Drunella Flavillineas (sp?). I had a great day one year during a Flav hatch on the Henry’s Fork........using the exact #14 Olive Sparkle Dun that we used to use for the large Cornutas at Shawmut. Sorry, was thinking about Hecubas. My fault. ONE time...we ran into a Crain Fly hatch on Slough... try to match a Crane fly- impossible. Except Gussa...he had bought 3 flies that imitate Crane flies...and POUNDED the fish. I went fishless. Never seen it again. There is a #26 fly in the Slough watershed we call the "SEED" fly...it looks like a seed from the Timmothy grass (and may be! )- and younger brother tired up some matching seed flies...I took some the next summer to make him happy. 1st meadow showed me that this fly will work- and I landed 3-4 fish on that fly. ONCE. Never seen them again. I had a day on the Beaverkill fishing Japanese beetles that I had tied- foam body with a peacock hurl body. Crushed big, picky fish one hot day. Not a hatch, but I fished a small pond in Vermont that was boiling with fish when I got there. There were no signs of any insect coming off, so I went through a bunch of flies until I finally hooked a fish. That fish was regurgitating water boatman. The closest thing I had was a leadwing coachman wet fly that I cut off the wing and most of the hackle. That worked great and the frenzy lasted about another hour and then was done, like someone had flipped a switch. I have never come across this again, but I never would have known what those fish were eating, if that first fish hadn’t overindulged itself. Anybody ever seen water boatman in Maine? Last edited by TMarchetti on January 31st, 2019, 9:28 pm, edited 1 time in total. I had a fantastic time last summer fishing adult damselflies to sipping smallmouth on the Penobby. I had fortunately purchased a few recently (I fish damsel nymphs at least once a year in ponds out west, but almost never adults), and we hammered the fish. Most of them sipped just like a trout. And they were pretty picky on that -- yes we caught some on streamers, but the damsels worked much better than anything else. Way, way back in the Bronze Age, when I used to fish the Farmington River in CT, I was shown a non-fly by the only guy catching fish. The very obliging fellow was only too happy to show me what he was using to catch fish after fish in a pool where everyone else was simply practicing their cast. It was 2 wraps of peacock hurl on a #20-something hook at the end of 12 feet of 7X leader. I've had boogers bigger than that fly. I didn't have anything like that on that day, but I did go back and try it. I managed to coax a few takes, but couldn't keep them on with that light tackle. But I was younger then... I could probably do it now.